It’s 1921. Ewa Cybulski (Marion Cotillard) and her sister Magda (Angela Sarafyan) sail to New York from their native Poland. They’re escaping their bleak homeland in search of a fresh start. Unfortunately Magda is quarantined at Ellis Island because of suspected lung disease. Meanwhile Ewa is almost deported due to an “incident” on the boat ride over. Bruno (Joaquin Phoenix) notices her ability to speak English and bribes an officer to let her go. Bruno runs a burlesque show and he hires Ewa to do the sewing. From that point on, their lives intertwine and they will never be the same. Bruno also manages a side business where he arranges, shall we say, appointments with the female performers in the show. Orlando (Jeremy Renner), a magician who performs at the burlesque house, becomes infatuated with Ewa. Could he be her knight in shining armor? But he also makes waves. This triggers a dark jealous streak in Bruno whose fondness for Ewa has grown over time. Director James Gray (The Yards, We Own the Night) has such a way with these character based dramas. The Immigrant is another fine example. The screenplay details the wants and needs of dissimilar people at odds with one another. James Gray and co-writer Ric Menello previously worked together in 2008 on Two Lovers. 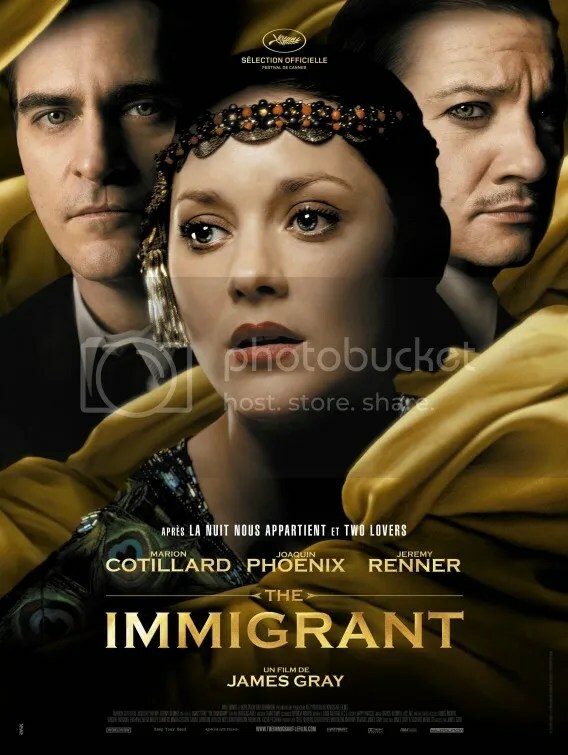 The Immigrant is the saga of what three disparate people must do in order to survive. The drama is so affecting. Ewa is that most exquisite of personalities. Seemingly plain and unkempt but with genuine allure, both physically and emotionally. Her beauty shines through. She needs to raise money to get her sister out of the infirmary on Ellis Island. It isn’t long before she succumbs to doing things she’d rather not do. The script reflects upon her moral struggle. How far is she willing to compromise her virtue in exchange for a noble goal? The idea is handled in a fascinating yet respectful way. Marion Cotillard portrays such sincere yearning. If she is the heart of The Immigrant then Joaquin Phoenix is the soul. In their 4th picture together Director James Gray extracts another brilliant performance from his frequent collaborator. Phoenix is riveting as the morally troublesome Bruno. His behavior includes distasteful business ventures. Yet there is a positive nuance to this mortal that gently persuades the audience to forgive him. His elemental desire to do the best thing for Ewa underlies a palpable tragedy. Orlando the Magician (Jeremy Renner) complicates matters for him considerably. They both pursue Ewa. The Immigrant is a beautifully realized period film that presents a knotty tangle of ethical decisions. It’s rather understated and probably why director James Gray’s work charms critics over mainstream audiences. The three protagonists are fully realized creations that captivate. What superficially appears like a love triangle is actually much deeper and morally complex. Gray has a talent for extracting raw emotion. Additionally, the production has a nice feel for time and place. Costumes and cinematography superbly add to the historical detail. The filmmaker grew up in New York City and it’s a place he returns to again and again in his movies. This is a story that upholds the promise of America, but doesn’t deny the cold harsh reality. This entry was posted on June 11, 2014 at 12:10 am and is filed under Drama, Romance with tags 2014. You can follow any responses to this entry through the RSS 2.0 feed. You can leave a response, or trackback from your own site. This is the latest release from The Weinstein Company, the same studio that distributed Philomena and August: Osage County. Harvey is so good at promotion so maybe this can some attention. Good review Mark. The cast is great with mostly everyone of Gray’s movies, and here is no different. He’s an incredible director. We Own the Night was his hit, but all of his films are good. great review. I liked We Own the Night. that premise about brothers on opposite sides of the law is a very intriguing conflict. The Immigrant seems to have its own fascinating conflict, employer vs employee. on a second read, maybe Orlando isn’t exactly Bruno’s employee. But still, Orlando performs in Bruno’s nightclub. And am also a big fan of Phoenix, so will be waiting to see this movie soon. Orlando is hired by Bruno’s boss Rosie (Yelena Solovey) but Bruno hires Ewa. That’s where most of the drama lies. This is the first synopsis I’ve read on the much-hyped film, and you had me hooked in the first paragraph! And what an all-star cast of my favorites! Can’t wait for this! Excellent review! Thanks. It’s a fascinating film with some nice performances. Nice review. This is a movie I’ve been eager to see for a while but I’ve found difficulty in finding a theater playing it. The blockbusters (Maleficent) can play close to 4,000 theaters. Meanwhile little art house pictures like this one get 150 at their peak. It’s a bit lopsided to say the least. I like when a good story benefits from great acting. Marion Cotillard, is such a great actress. She is supported well by Joaquin and Jeremy. The subject is a bit heartbreaking, but you really felt that Marion’s character had to do what she did in order to help her sister. She did find a way to take charge of her situation and make a difference. I like it a lot. 4 stars. Agreed. Marion Cotillard was incredibly sympathetic. I don’t like Joaquin Phoenix most of the time, however I did appreciate his performance in WE OWN THE NIGHT and thought that was an effective collaboration with James Gray. I also tend to value character driven films, which is why I think I’ll like this movie. I quite like him as an actor. He seems to change it up quite a bit.